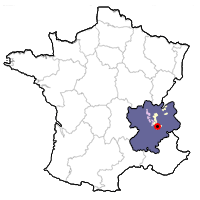 Domaine Jean-Pierre et Jean-François Quénard owns 15 hectares (37 acres) of vineyard around the village of Chignin. ​Jean-François Quénard took over for his father Jean-Pierre in 1987. Having studied at wine school in Burgundy with Yves Chéron from Domaine du Grand Montmirail in Gigondas, Jean-Francois has also studied winemaking in Bordeaux and California. Their domaine lies in one of the most beautiful spots of Chignin, next to the Tour Villard (part of the ruined Château de Chignin). 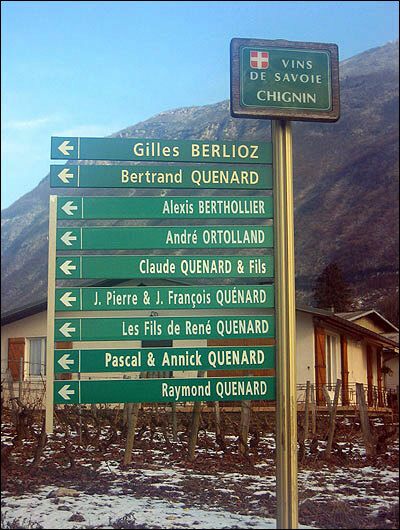 There are a number of other wine producers in Chignin named Quénard, including Andre and Michel Quénard and Raymond Quénard. Seems like Quénard is the Smith and Jones of the Alps! Trying to find the right Quenard in Chignin can be difficult. 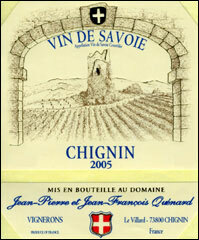 The Chignin is made with 100% Jacquère from 40-year-old vines planted on clay and limestone soils. Fermentation is in stainless steel tanks, with partial malolactic fermentation. Tasting Notes: It has wonderful texture for a mountain wine, and shows notes of dried apricot, a touch of nut, minerals and white pepper. A crisp, dry finish completes the package. Delicious good value summer white. 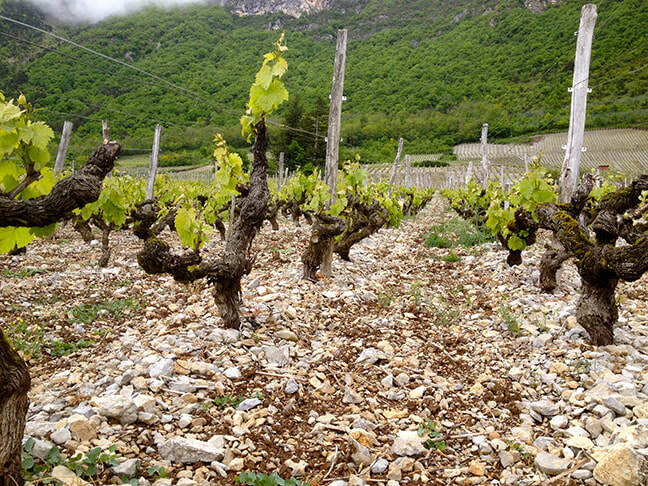 This cuvée is made from 65-year-old vines, grown on chalk and limestone soils. After being harvested by hand, the grapes undergo a long fermentation with full malolactic. The lies are stirred in the tank for two months to give the wine additional richness and complexity. Production is just over 600 cases a year. Tasting Notes: The wine shows mineralled notes (tonic) as well as higher-pitched floral notes. Something like a hypothetical cross of Grüner Veltliner and Muscadet. 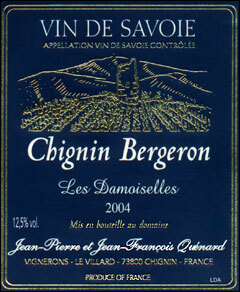 Bergeron is the local name for Roussanne. 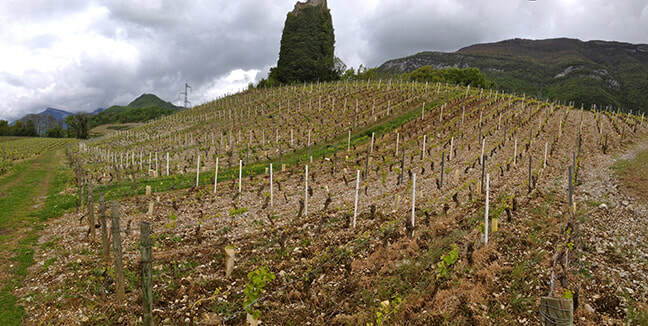 The Damoiselles — or young lady — cuvée (the Quenard's have four daughters) is made from 30-year-old Roussanne vines grown on the steep, chalk rich hillside slopes of Chignin. The grapes are hand-harvested parcel by parcel, and undergo a long fermentation in stainless steel. Malolactic fermentation helps give the wine additional richness on the palate. Tasting Notes: The wine has lots of fruit on the nose, with creamy apricot and white peach rising from the glass. Food Match: The medium to full body of this wine, along with its subtle minerality, makes it an ideal partner for fish in sauce, scallops, poached salmon or white meats.